We’re almost fifteen years into the new millennium and rather than ushering in an era of peace and prosperity, so far its defining features have been extremism and austerity. One manifestation of that extremism has been increasing terrorism. Terrorism arrived with a bang at the beginning of the millennium with the September 11th attacks on the World Trade Center and Pentagon. The impact on the U.S. emotionally and psychologically cannot be overstated but in many ways we’ve rallied and recovered from that attack on our economic and military power. So far, it’s not clear we’ll do as well managing the campaign of domestic terrorism that has held the nation captive for the past five years and no, I’m not talking about gun violence and mass shootings as awful and frequent as they’ve become. I’m talking about the terrorists who’ve dominated our political discourse since the summer of 2009 collectively known as the Tea Party. From its inception Tea Party supporters defined themselves in two distinct but related ways – first, a clear distrust and contempt for government; second, a need to express their distrust and contempt in the angriest way possible. Early Tea Party rallies were notable for the number of placards and signs depicting Barack Obama as Satan (enemy to all Christians); Hitler (U.S. enemy during the last ‘good’ war-WWII) or as generic Muslim terrorist (current national enemy) – you get the idea. He was the ENEMY PRESIDENT a usurper of power and threat to the nation. The Tea Party took its name from identification with the Massachusetts colonists who demonstrated their distrust and contempt for British government by illegally seizing and dumping imported tea in protest of increased taxes, the first salvo in what became the American Revolution culminating in independence from Britain and formation of a new government. It’s a nice association, conjuring up positive images of courageous, patriotic people willing to risk all for an ideal, the possibility of greater freedom….it’s romantic and appealing but hardly appropriate for today’s Tea Party. The Tea Party movement has associated itself with the wrong revolution… they have more in common with the French Revolutionaries than the American. Their character, tactics and goals are consistent with and reminiscent of, the extremists of the French Revolution, organized around a debating society known as the Jacobin Club that took power during the most critical part of the Revolution and will be forever remembered for ushering the infamous period known simply as “The Terror”. Like the Tea Party, the Jacobins came to power riding a wave of populist contempt and rage at government, the first target – the failed monarchy of Louis XVI. The leaders of the Jacobins were best known for the fervor of their hatred of the monarchy and their willingness to use any means to bring it down. It was the Jacobins who insisted it was not enough to depose and imprison the king, his blood needed to be shed in order for the people to be truly free. Like the Tea Party, the Jacobins were not poor but they identified themselves with and claimed to speak on behalf of France’s impoverished and exploited people. Like the Tea Party, the Jacobins claimed to be defenders of family values and personal freedom from licentious and profligate tyrants. Like the Tea Party, the Jacobins believed their assumption to power was a necessary prerequisite to creation of a virtuous society. Their path was the path of truth and light, compromise was not an option, all who refused to follow were outside the new body politic, not a true ‘citizen’. The Jacobins sealed their allegiance to the French people with blood – the blood of King Louis XVI and his wife Marie Antoinette on the blade of the Guillotine, soon to be known as the ‘national razor’. Like the Tea Party, Jacobins valued loyalty above all – true revolutionaries were willing to shed the blood of those who were enemies of the people – anyone who didn’t support the goals and actions of the revolution was an enemy of the people. There are many personal parallels between the most famous Jacobin leaders and today’s Tea Party luminati. The malcontent Marat, publisher of the most vitriolic of all the revolutionary newspapers was a prototype for Rush Limbaugh, a perennial blowhard with no concept of restraint and no sense of basic decency. His rabid hatred of the aristocracy and all political opposition led him to propose ever-increasing acts of violence and revenge – acts he had neither the desire or ability to control. Like Limbaugh, he was a physically unattractive man who hid himself from the world (Rush hides in a radio studio behind a microphone) in long, therapeutic baths while his inner bile spilled forth. Danton, the man who came to prominence as ‘defender of the people’ the firebrand who rallied the French to meet the European armies and protect the fragile democracy, brings to mind Newt Gingrich a man of similar firebrand nature, a big man with big ideas that never match up to their hype. Saint-Just, the cold, emotionless Jacobin who believed quite fervently that dissent = death and never met a suspect he did not want to punish is most like Grover Norquist who famously said he didn’t want to destroy government, he just wanted to make it small enough to drown in a bathtub. Like Saint-Just, Norquist’s arrogance knows no bounds and confounds his critics who don’t understand the source of his appeal. The most powerful and influential Jacobin was Robespierre, who was dubbed ‘the Incorruptible’ because of his ascetic lifestyle and unwavering commitment to the revolution. Robespierre was a small town lawyer who came to prominence because of his sharp mind and oratory. His ability to command attention and sway a crowd was legendary and made him a formidable foe. The Tea Party leader who consciously or not is most like Robespierre is Ted Cruz – another relatively obscure lawyer who has blazed a trail by becoming a media darling for his willingness to do or say anything – no matter how outrageous or untrue – that will further his political profile or agenda. Like Robespierre, he is extremely manipulative as evidenced by his ability to coerce his colleagues into supporting tactics that are both risky and ultimately self-destructive. Both Robespierre and Ted Cruz are notable in their willingness to embrace fear and terror as legitimate political tools. As a small town country lawyer Robespierre had railed against the death penalty, a decade later he was one of the chief proponents for executing the deposed king, Louis Capet. After the death of the royal family and most of the remaining aristocracy, Robespierre decided to up the ante by going after anyone who was an “enemy of the revolution”. As a disciple of Rousseau, he believed in the concept of the ‘virtuous’ society. He believed the goal of the revolution was to bring that society into being. Terror, in his mind emanates from virtue, you needed it to have virtue manifest. 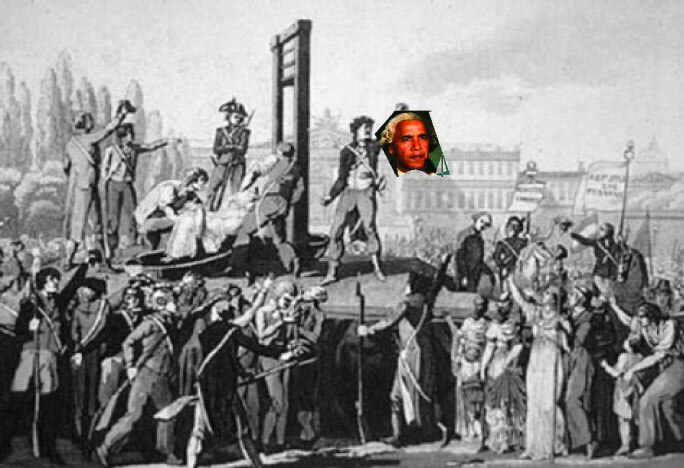 Robespierre famously said, “Virtue without terror is impotent, terror without virtue is cruel.” This became the guiding principle of the Jacobins which ultimately led to the deaths of more than 55,000 French citizens before Robespierre’s head finally joined the others in the basket under the guillotine. It’s certainly not a stretch to say that Ted Cruz has embraced tactics that amount to political terrorism – shutting down the federal government; threatening default on repaying government debt; attacking the integrity and patriotism of colleagues and officials who disagree with him; supporting fratricidal primaries against fellow Republicans that are deemed insufficiently conservative. Like the Jacobins, the Tea Party is implacable and hyperbolic. Fundamentalism guides their thinking and actions. You are either with them or against them and that applies to friends and foes alike. Changing facts and circumstances do not generate changes in policies or practices. If the facts are against you, ignore them, double-down on your propaganda and do everything you can to silence or marginalize critics. Like the Jacobins, the Tea Party has cast moderation as a sign of weakness – that may work in the sporting ring but it makes democratic governance impossible. We are living in year five of Tea Party terror. They have brought political and economic terror to the country in ways not seen since the period leading up to the Civil War. The contempt and distrust of government expressed by Tea Partiers is similar to the sentiment that led to the Confederacy. The call to arms and need to protect “our way of life” are the same words southerners used to rally against ‘northern aggression’. The appeal to racial solidarity over economic interest is what drove poor southern farmers to join leaders of the plantocracy and risk their lives in defense of a system that offered them little except the chance to dominate and exploit blacks. The willing embrace of terror and violence as tools to gain and maintain power were the modus operandi of segregationists and racists – then and now. Like the Jacobins, Tea Partiers see themselves as motivated by patriotism and national pride. They believe they are protecting democratic principles from tyranny. The problem is, like the Jacobins, their rigidity, unwillingness to compromise and vicious attacks on critics or opponents eventually turns them into the thing they purport to hate. By the time of their political implosion in July, 1794 the Jacobins had created a political system as venal, corrupt and murderous as anything that existed under the monarchy. Tea Partiers don’t live in an age when opponents can be disposed of by physical beheading but the Republican primary has become the political equivalent of the guillotine as Eric Cantor discovered to his eternal surprise. By threatening to end the political careers of Republicans not deemed sufficiently conservative or sufficiently hostile to the ENEMY PRESIDENT, the Tea Party has moved the Republican Party and by extension the rest of the country dramatically right. By refusing to compromise with the President or Democratic members in Congress the Tea Party has generated a self-fulfilling prophecy of government incompetence and ineffectiveness, thereby reinforcing cynicism and contempt for government generally and this president specifically. The Jacobins soon found they had unleashed forces beyond their control. The anger they consciously stoked in the masses became organized mobs of peasants known as the san culottes. They hated anyone and everyone who had more than they did and it did not take much to whip them into a murderous frenzy. In trying to control them, the Jacobins brought their leader into the circle of power but to keep them satisfied they had to constantly up the ante on the violence and vitriol. Sound familiar? Any group that sustains itself on stoking fear and violence will end up full of extremists as they are the people able to sustain and feed off anger for extended periods of time. What’s at stake now as then is democratic governance. The Jacobins killed the revolution they helped spawn through their extremism and violence. They paved the way for Napoleon and military dictatorship. It would be decades before the ideals of the French Revolution and Declaration of the Rights of Man would be permanently manifest in French government. The Tea Party may not have the guillotine but the Congressional budget process is allowing them to do a pretty good job of knee-capping the economy. The Tea Party are not patriots out to protect U.S. democracy, they represent the greatest threat to democracy. Eventually Robespierre and his Jacobin supporters went too far, they created a climate of such fear and violence no one felt safe. When the end came, it was swift and complete. Not sure what too far looks like for the Tea Party – I thought it was the government shutdown, clearly I was wrong. Let’s hope their star falls before the damage is irreparable. This entry was posted in News and Views, Politics and tagged Barack Obama, Congress, extremism, French Revolution, Grover Norquist, guillotine, Patriots, Republicans, Rush Limbaugh, taxes, Tea Party, Ted Cruz, Terrorist. Bookmark the permalink. 1 Response to The New Jacobins…..